I recently paid a visit to my Mother in my home town of Jeffersonville, Indiana. She took us to lunch at Schimpff's. This was my first time in the place and actually I had never even heard of it until I saw a story about it on History Channel's 'Modern Marvels'. A very friendly, family owned business with, obviously, a lot of good things to eat! G.A. Schimpff immigrated from Bavaria and began making candy in Jeffersonville in 1871 and has been at this location since 1891. 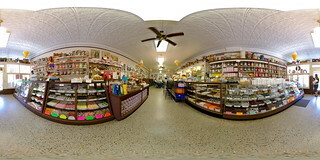 Schimpff's Confectionery is most famous nationwide for its Red Hots, which they have continued to hand make since the store's opening. 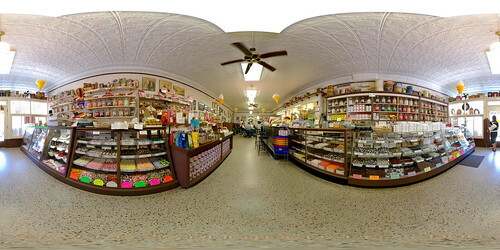 This location houses a fantastic museum with thousands of pieces of American candy memorabilia. They also let you watch the intensive candy making process. And if that isn't enough motivation to visit the place, they give out free samples! Pentax K10D, 10-17mm Fisheye, Nodal Ninja 3. 7 shots (5 vertical pan, 1 zenith, and 1 nadir). An 8th hand-held shot was used to patch the mounted nadir shot.